BugLabs Beta is a go! I'm honoured to have been chosen in the first wave of beta testers to get access to the BugLabs beta. I read about BugLabs in an Engadget blog post and it sounded intriguing: "An open source, web-enabled, modular software + hardware platform." By the way, please keep these links to yourself, they should all be considered confidential to the beta program. You are welcome to blog about, chat about, Twitter about, text about, email about, or send smoke signals about the beta program, but please don't share the links or SDK. They have bug tracking, forums and a WiKi already up and running, and they made an SDK available. The SDK includes VirtualBug: an emulator for the hardware, since hardware isn't available at this stage. 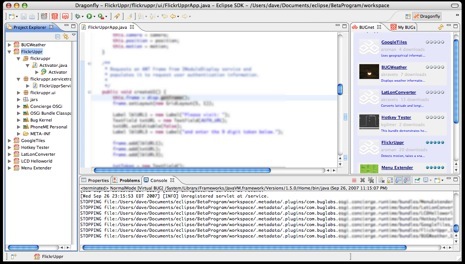 They built their SDK on top of Eclipse and I have to say it's pretty slick for things being so early. The instructions to get everything up and running are also unusually polished for a beta program. There are a few sample applications that do real things, like post pictures to Flickr with geo-tagging. Some things are still necessarily in the mock-up stage until the hardware is ready, like the camera module (which pulls pictures from file rather than an actual camera) and the motion sensor (which 'detects' motion by you typing the word 'motion' into the Eclipse console). Still, I'm very impressed at how it looks at this point. The few questions I've had have been replied to promptly in the forums and the folks at BugLabs all seem very helpful. I'm still getting my feet wet in the SDKs, but I'll post updates as I make progress.